Towers designed for communication, once almost exclusively made of wood, are now almost exclusively metal. Metal is sturdier and less susceptible to termites, but at some point it is going to break, bend, thin, or develop holes. Though most towers which are used outside are galvanized, there is still a small chance for rust. Exposure to the elements, plus time, means that many of the towers which were built at the beginning of the technology boom are now reaching a point where they need repaired and/or replaced. This has made the demand triple for climbers who can also weld. It is a skill that takes time to learn, but if you can do both, then expect to be able to secure a job almost anywhere. Plus, this position comes with a hefty salary increase in most places. 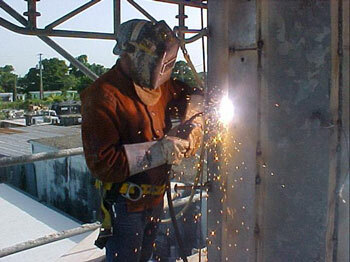 Some companies need a person who can weld so badly that they are training welders how to climb. And, it is not just repairing old towers where welders come in handy. During the construction of a tower, pieces need to be fitted together and secured. Bolt and nuts need to be welded into place to ensure the longevity of the tower as a whole. Welders who are used to working with galvanized pipe, iron, cast iron, and other materials will have one part of the necessary skill set already. It is the fear of the climb though. Even guys who are comfortable with ladders, roller coasters, being on rooftops and skydiving, are sometimes shocked to discover that they are afraid of the climb. Climbing is unlike other forms of being high up. For one, except for skydiving, it can be a lot higher than being on a roof or even on a skyscraper. The bottom of the towers need welded too, but at some point everyone working on the tower will have to go up. The first climb is usually the toughest for people, but on that first day, they know if they’ll be coming back. The MIG and TIG welders used in welding operations are hoisted up with a crane to bring them to a level where the one making the weld can better reach it. This means that many of the things which can go wrong with a welder must be fixed in air. This includes fixing jammed wire, reloading spools, and calibrating the flame. It takes a level of comfort with both welding and climbing to establish such a feat. Many employers are offering incentives for employees who are willing to learn the welding trade, these can come in the form of more hour flexibility, increased salary, and/or paid tuition. If the company that you work with does not offer these incentives, it may prove beneficial to bring them up to management. If it turns out that you are skilled at both climbing and welding, there is a greater potential for you to get a well paying job anywhere in the country you would want to live. With time and training this specialization proves to provide a very comfortable for those who do not fear the climb.